Lucky number 7! Hey, maybe we’ll hit the jackpot! So, as I mentioned yesterday, we had a great Mario marathon this year. It had so many funny and fantastic memories. And one of those memories is the unveiling of Untuxable’s Crypt of the Mushroomdancer mod for Necrodancer! It’s a total conversion, turning just about everything in the game into a colorful, adorable Mario character. You should check it out! We here at TSG have a history with Necrodancer, what with us giving the world a sneak peak at the game during our indiethon and getting a chance to interview the developers. That’s why today’s ice level is Zone 3, from Crypt of the Necrodancer! Necrodancer’s a pretty slick game, really. It’s a hybrid of rougelike and rhythm, a combination nobody’s ever seen before. The main character is Cadence, a young, headstrong girl who went searching for answers to the mysteries surrounding her family. Falling into the underground tunnels, she was fatally wounded, only to be revived by the Necrodancer himself. Now forced to move to the beat of his music, she has to find a way out. Everything in the dungeons dances along to the same song, so you’ll have to think fast if you want to escape from or defeat the monsters. Needless to say, the soundtrack is amazing. Zone 3 has an ice and fire theme, which really changes things up from the previous two Zones. 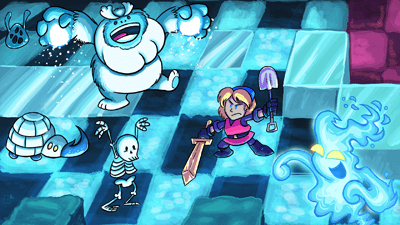 On the cold side, you’ll find a lot of frosty enemies, including ice elementals that leave a trail of ice tiles in their wake, ice beetles that create a huge patch of ice when struck, and of course, Klappa the yeti, which has a wide range to its snowball attacks. Oh and of course, an ice dragon might appear too, which is a huge pain because that thing can freeze you in your tracks and enable every hostile creature in a five-mile radius to chew your skin clean off. The ice panels are also very tricky, since jumping onto them sends Cadence sliding down every other ice panel next to it. Zone 3 is challenging, but don’t worry! When you beat it, you’re rewarded with the even more frustrating Zone 4! I’m not kidding; I think that’s genuinely great. Necrodancer’s the most fun you’ll have losing over and over again! Beatdowns to the beat, you say? I’M IN! Full wallpaper is HERE! C’mon, you know I can’t do a Necrodancer post without the music. In fact, this is a special music post because all the remixes are actually in the game itself! Certain other characters have their own variants of the soundtrack, and they’re all so incredibly good. Stone Cold, Dance of the Decorous, and A Cold Sweat all play in the icy sides of the Zone 3 dungeons, all by the always-rad Danny B himself! A_Rival did the synth version of the soundtrack, so here are those versions of Stone Cold, Dance of the Decorous, and A Cold Sweat! Not only that, but FamilyJules7x provided rock versions of the game’s score, so here are his renditions of Stone Cold, Dance of the Decorous, and A Cold Sweat! 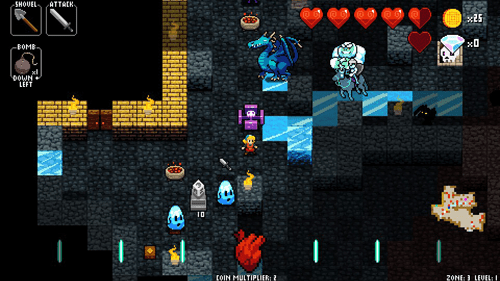 Seriously, get Crypt of the Necrodancer. Heck, get it for your friends for the holiday too! You won’t be disappointed, trust me. But if you want to hear those remixes in-game, you’ll want to really get good at it, so good luck. And if you want to see tomorrow’s ice level, then you better dance on back here and see it for yourself!